How did 9/11 conspiracism enter the mainstream? George W. Bush gets word of the 9/11 attacks while reading a book to schoolchildrenIn the immediate aftermath of 9/11, conspiracists started to create and spread what would ultimately become the foundational mythology of the 9/11 conspiracy movement: In order to suppress civil liberties and benefit their allies in the oil and gas industry, hawkish neoconservatives in the Bush administration—along with their partners in the CIA and FBI, of course—orchestrated a massive terror attack that killed 2,977 innocent civilians and mobilized the American populace behind otherwise unsupportable wars in Afghanistan and Iraq. There is no consistent polling about the popularity of this theory. But in the early years of the decade, at least, it was relegated to the far reaches of the American political spectrum, a place memorably described in Richard Hofstadter’s Paranoid Style in American Politics. In May 2002, with Bush’s approval rating still well over 70 percent, fewer than one in 10 Americans in a CBS News poll said that the Bush administration was lying about what it knew regarding possible terror attacks prior to 9/11. 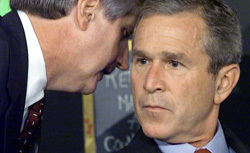 By April 2004, 16 percent of respondents in a CBS News poll said that the Bush administration was “mostly lying” about what it knew about possible terrorist attacks against the United States prior to 9/11, while 56 percent said it was telling the truth but hiding something and 24 percent said it was telling the entire truth. By the five-year anniversary of the attacks, one in three Americanswould tell pollsters that it was likely that the government either had a hand in the attacks of 9/11 or allowed them to happen in order to go to war in the Middle East. What caused these ideas, by the middle of the decade, to enter the political mainstream? It’s hard to say whether widespread discontent and mistrust makes people more willing to listen to ideas they previously considered absurd. But it seems plausible. And there can be little doubt that by the middle of 2006, 9/11 conspiracy theorists had a new base to draw from. That base was general unhappiness with the war in Iraq and a small but deep strain of Bush hatred. The 9/11 conspiracy theories got a hearing in Europe and among liberal intellectuals like Gore Vidal before they rose in popularity in America. French author Thierry Meyssan’s 9/11: The Big Lie, which postulated that the Pentagon was not struck by a jetliner but by a smaller military aircraft or a missile, was the No. 1 best-selling book in France for six weeks in the spring of 2002. By October, Vidal was seriously exploring a wide range of conspiracy theories that the Bush administration had been complicit in 9/11 for geostrategic reasons in an essay in Britain’s Observer. At home, such talk remained on the fringes of political life even as the war got under way. But fueled in part by anger over the deceptions of the war, the lack of accountability or disclosure on the part of the Bush administration with respect to the 9/11 Commission, and civil liberties abuses in the aftermath of the attacks, the popularity of conspiracy theories was steadily growing in 2003 and 2004. Then, in the summer of 2004, Michael Moore’s Fahrenheit 9/11 was released, earning more than $100 million to become the top-grossing documentary of all time. While Fahrenheit 9/11 does not allege any sort of Bush-led conspiracy concerning 9/11, the film does depict a government hell-bent on covering up how much it knew prior to 9/11 and using the attacks as a false pretext for a war with Iraq. In 2004, more and more Americans were willing to raise these kinds of questions. Bush derangement syndrome, as Charles Krauthammer would famously call the emerging trend of Bush hatred, had not yet reached a boiling point. But it would. Within three years of his film’s release, Moore himself would start giving credenceto some of the more out-there conspiracy theories. When I asked several leading 9/11 conspiracists who or what inspired them to join, they did not name self-proclaimed founding father Alex Jones. As popular as Jones is, and as much influence as he has had in spreading the 9/11 conspiracy theory, the 37-year-old Texan new-media provocateur is not the movement’s intellectual leader. That title belongs to the grandfatherly 72-year-old academic David Ray Griffin. On 9/11, Griffin was a well-respected professor of philosophy at the Claremont School of Theology in Southern California. Believing that the attacks had been prompted by overly interventionist American foreign policy, Griffin shortly thereafter began working on a book about American imperialism. He was two-thirds of the way through with the project when, in March 2003, a colleague sent him a link to Paul Thompson’s terror timeline, a go-to source among 9/11 researchers of all stripes. The timeline includes more than 5,000 reports that catalog every mainstream media account that could be cited as demonstrating inconsistencies in the official story or the possibility of government foreknowledge. It describes dozens of warnings about an upcoming terror attack prior to 9/11, all reported in mainstream media, and points to allegations that members of the Pakistani-ISI had aided the 9/11 attackers, strongly implying that the CIA also knew. At the time that Griffin picked up the timeline, it also pointed to inconsistencies in NORAD’s story and wondered aloud why the planes had not been intercepted. All of this was simmering in Griffin’s mind in March 2003. “We realized how important 9/11 was when we saw it wasn’t just attacking Afghanistan, but then using that to go into Iraq,” Griffin told me. When one of his students asked him to put together a presentation about 9/11 as the pretext for the war in Iraq, Griffin obliged. Soon after he began working on a magazine article based on the presentation, which would eventually become too sprawling for a periodical. It became The New Pearl Harbor, published in 2004, the first of more than 10 books Griffin has written about 9/11. 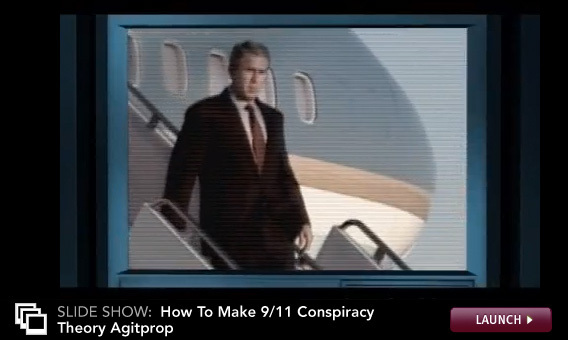 Although it relies upon factual inaccuracies, leaps of logic, and selective quotations to create a complex web of conspiracy leading to the top of the Bush administration, Griffin’s work is still held up by 9/11 conspiracy theorists as a masterpiece of the genre. Former University of Wisconsin lecturer Kevin Barrett, who is the leading advocate of theories that Israel’s Mossad orchestrated the 9/11 attacks, is one of the conspiracists who cites Griffin as his inspiration for joining the movement. Barrett came to renown in 9/11 conspiracy circles in 2006 after being castigated on Fox News by Sean Hannity and Bill O’Reilly during anational debate about the 9/11 conspiracy theory and academic freedomon the Madison campus. Over the next several months he held teach-ins on the Madison campus. But he never took his activism beyond that until just days after President Bush’s re-election. It was the second battle of Fallujah, which took place during the Muslim holy month of Ramadan, that caused Barrett, who had converted to Islam years before, to become a full-time activist. “The images and the stories coming out of Fallujah were so atrocious,” he said. “That actually was the moment when I said, ‘Well, I need to take this to the next level. What can be done to stop this growing war?’ ” After Fallujah, Barrett decided to start a group called the Muslim-Jewish-Christian Alliance for 9/11 Truth. After losing his teaching job, in 2007, he turned his attention to conspiracism full time, and he continues that work to this day. After realizing that a full-budget action feature was too ambitious for an 18-year-old director, Avery decided to turn his film into a documentary. Working with his childhood friend Korey Rowe, who had just returned from a tour of duty in Iraq, Avery cut together an 82-minute documentary that compiled many of the more out-there conspiracy theories about 9/11, including the charge that the South Tower was not struck by a United Airlines commercial flight but rather a military drone. The film, produced for $2,000, was released in April 2005. At the time, Avery was working as a waiter at Red Lobster. It didn’t do spectacularly well. Avery struggled to get Alex Jones to cover it on his website, and the movie was attacked by others in the movement for its factual problems. In response to the criticism, Avery cut a new edition and released it at the end of 2005, which turned out to be “the perfect time.” Discontent with the Iraq war, and the Bush administration generally, spiked in 2006 as sectarian violence tipped into civil war. A majority of Americans consistently said that the Bush administration had deliberately misled the public about whether Iraq had weapons of mass destruction, while 58 percent said thegovernment was misleading the public about how the war was going. Bush’s approval rating sunk to new lows. “The distrust built up over time,” Avery said. “It led, I think, to the culmination of the movement in 2005, 2006, which is when a lot of people had these doubts that were building up over years, but didn’t really have an outlet for it.” In July 2006, a Scripps-Howard poll found that 36 percent of Americans said it was “somewhat likely” or “very likely” that federal officials assisted in the 9/11 attacks or took no action to stop them because they wanted the United States to go to war in the Middle East. A Zogby poll one year later found 31 percent saying that elements of the government either orchestrated the attacks or let them happen for geopolitical reasons. Since 2006 Avery has re-cut the film twice more, removing some of the more outrageous accusations, like the claim that Flight 93 had been diverted to Cleveland Hopkins Airport rather than crashing in Pennsylvania and that calls made from the plane had been faked using “voice-morphing” technology. After interviewing some of the Pentagon witnesses in person, Avery has even backed away from the stance that it was a missile and not a plane that hit the Pentagon. “It’s easy to come to conclusions when a) you don’t have a lot of information at your disposal and b) you haven’t had a chance to actually talk to people who were there,” Avery says. Part 3: How the 9/11 movement responded to its critics. Click here to launch a slide show on the top five techniques of 9/11 conspiracy theory documentaries. This entry was posted on September 11, 2011 at 10:13 am	and is filed under News and Politic. You can follow any responses to this entry through the RSS 2.0 feed. Both comments and pings are currently closed.